Determining what backpacking tent to pick for your next outdoor adventure can be a challenging task. This difficult decision can leave you hemming and hawing for hours, wondering what kind of tent will best suit the needs of you and your camping buddies. Often, you will feel as though you need to compromise between competing factors. Usually, however, all you need to do is decide on which factors are most important to you. How many people are going with you, and what size are they (important, because a fully grown adult takes up much more room than your five-year-old daughter, for example!)? How much weight or extra gear do you plan on packing in? How dry do you need to stay? And (arguably, most importantly), how much money do you want to spend? These questions are important ones that you must be prepared to answer as you set out to buy your first (or third, or fifteenth!) backpacking tent. 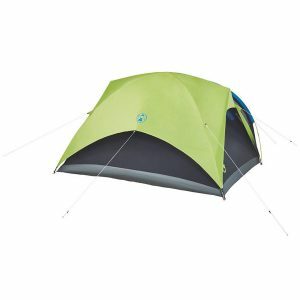 Consider our review of the Coleman Carlsbad 4 person Tent with Screen Room as you embark on your next purchasing decision. Campers rave about the stylish appearance of this tent’s dark room and outer appearance. It is colorful and vibrant, and comes with a side room made out of a special darkening material. This darkening material allows you to sleep well into the morning. The tent has a ton of ventilation, making it a good option for camping in hot or stale-feeling weather. Customers aren’t crazy about the skill it seems to require to set up this tent. The tent comes with instructions, but they are hard to comprehend and mostly consist of diagrams and images. These diagrams can be tough to follow, without explaining what certain color coding and labeling actually means. For best results and the quickest set up, campers should lay out all of their equipment before beginning the assembly process. In addition, the poles fight very snugly in the sleeves, just be careful not to over exert and tear the material. After a couple uses though, this is no longer a problem. This tent can fit a queen size airbed, offering a center height of about four feet and eleven inches. While this does not allow most adults to stand inside the tent, it is plenty spacious enough to sleep a minimum of two fully-grown adults. The tent also has an extended dome structure, offering a main room under the dome and a screened room in the extension. You don’t have panels, so while the screen room is not completely sealed, it is perfect for cooking and sitting as long as it’s not raining. You could also sleep under it in good conditions. Since the tent has darkening technology, it also keeps the tent much cooler. Light is reflected much more easily from this tent than it is in conventional tents, allowing a good percentage of sunlight to be reflected away from the tent inside of absorbed inside, as with conventional dome tents. This tent is mostly – though not entirely – freestanding. It does not have a hub element and instead has sleeves, meaning you need to pass the poles through the sleeves. While you will attach them to the corners and the main structure is self-supporting, you need to tension the screened area of the tent so that it is fully functional. Without staking this portion of the tent, there is a good likelihood that it will move under windy conditions. Made out of polyester taffeta, the tent has an exclusive bathtub design that is durable and contains welded seams. 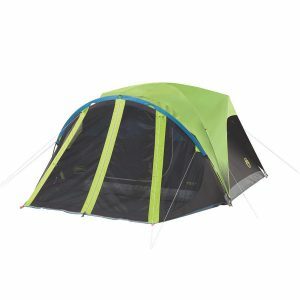 The tent has two side windows, an unusual but welcomed feature for a dome-style tent. The fly offers only partial coverage, with one of the poles creating awnings above the windows so that you can keep them open at all times without having to worry about getting soaked. The inner door also has a window. The tent’s poles are made out of fiberglass, which is arguably not incredibly durable. However, it is relatively lightweight with four poles total that pack down easily. 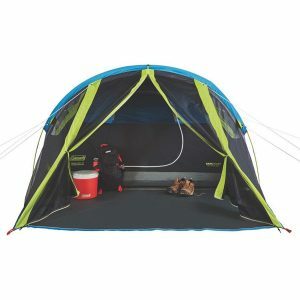 The Coleman Carlsbad 4 Person Tent comes with a number of “bonus features” that make it a good value for the money. 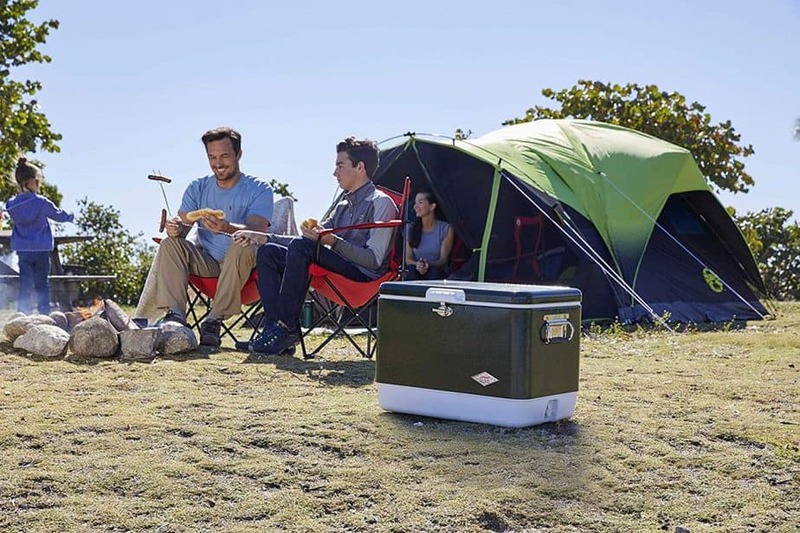 For example, several storage pockets that are conveniently sewn into the side panels of the tent allow you to store your belongings, like flashlights, car keys, and cell phones, off the floor for easy access. The tent also has an included carry bag, which expands with a rip-strip to provide extra storage space. You don’t have to worry about stuffing an oversized tent and all of its accompanying accessories into a small space, but instead can fit all of the necessities into a single container. The tent also comes with an electric cable port. If you don’t typically travel with a ton of electronics, this may not matter. However, for car campers or for people who need to camp with certain equipment (like sleep apnea machines, for example), this is a necessary feature that makes packing in electrical equipment a whole lot easier. The side of the tent is equipped with a portal so that you can easily slide in a power cord without having to worry about soaking that entire side of your tent if it rains. Like most four-person tents, the most common complaint about this tent is that it doesn’t actually sleep four adults comfortable. The total area is about ninety-nine square feet, making it a bit cozy for multiple adults. However, that’s true of most four-person tents, and this tent is a great pick for couples who are looking to get some extra sleep a little later in the day. You can easily fit a queen mattress, and you will sleep comfortably through the night with extra ventilation and comfortable floors. Coleman offers a diverse group of campers a unique opportunity with the Carlsbad 4 Person Tent with Screen Room. If you prefer to stay up until the wee hours of the morning – and to sleep in long after the sun has risen – this tent is the right choice for you. It’s excellent for campers who want to sleep in or are attending music festivals, where nighttime may not be the best time to sleep. 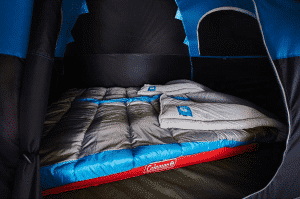 Consider this option if your quality of sleep trumps all other factors in your tent purchasing decisions. Think you might need a larger tent? Check out our Top 5 Best 6-Person Tent Review Post – Read It Here.